It’s the start of Pac 12 play! Who is excited? I know I am! 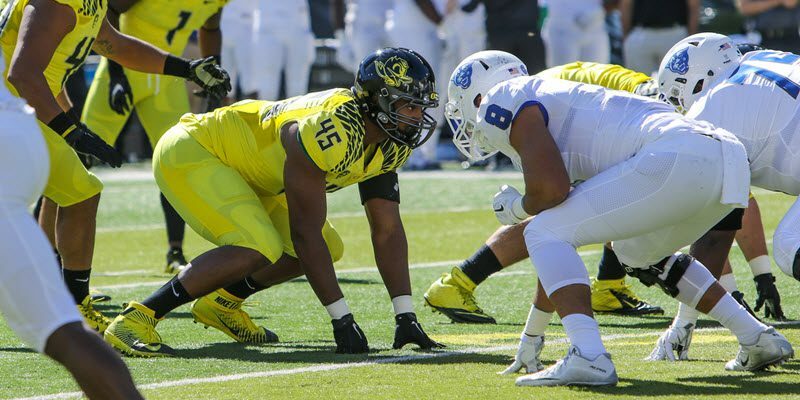 The Ducks kick off conference play against Utah Saturday in Autzen Stadium. It’s move-in weekend for the students (that includes myself), so you know the student section is going to be pumped. Last week, we found out that Vernon Adams’ broken finger was bad enough to make him miss last week and now he may be out this week as well. Utah is in the same situation. Travis Wilson, the Utes’ first-string quarterback, missed last week with a sprained left shoulder. Both teams are keeping quiet about who is going to be starting on Saturday. This is not your typical triple option. Kendal Thompson, the Utes backup QB, started the game last year versus Oregon and played very well until he got hurt. Thompson is a bit more mobile then Wilson, so the Utes love running the triple option with him and the zone read with Wilson. Since most of you know all about the zone read, I’m going to focus on the triple option. 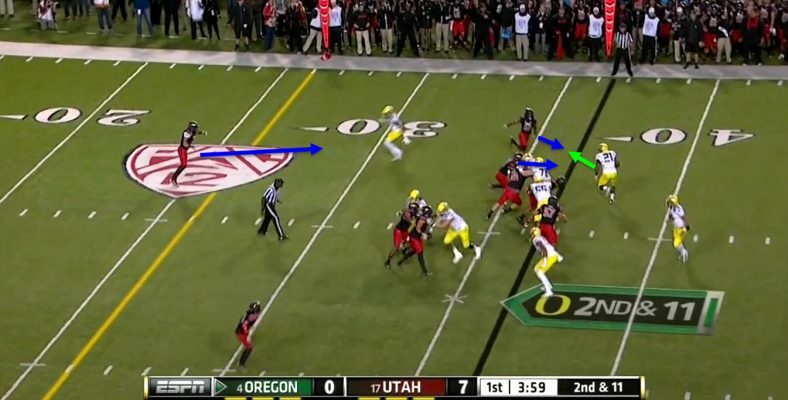 As you can see above, the Utes are lined up in the shotgun with a running back to the quarterbacks left and right and two receivers wide right. The Ducks are lined up across from the Utes in a 3-4. The quarterback reads the left defensive end. The triple option is most likely going to be run to the field side, which in this case is the right side. At the snap, Thompson is first going to read the left defensive end and decide whether to hand the ball off to the running back to his right or pull it and take it himself. The quarterback is then going to read the left outside linebacker. If the linebacker commits to stopping the quarterback, Thompson will pitch it to the running back. He then reads the left outside linebacker. Thompson sees that the linebacker commits to stopping him, so he pitches it to the running back. This whole time the receivers, lined up wide right, have been setting up to block the corners covering them. The ball carrier now follows those blocks and walks into the endzone for a touchdown. Booker is able to walk into the endzone. The triple option can be run in many ways, i.e. Georgia Tech, and the way the Utes run it with Thompson and star running back Devontae Booker, speed kills. The Utes are going to want to pound it with Booker, an all-American candidate, but when they feel Oregon is getting complacent, watch for the speed triple option or this next play. The tight ends have to prove they are a threat. As you see above, the Utes are lined up in doubles with a two tight end set. The tight ends are going to be the key to this play. The safeties and linebackers are taken away from the receivers. At the snap, the tight ends are going to run deep routes. There are a multitude of routes that can be run. All that these routes need to do, is force the linebackers and safeties to cover them to keep the receivers in single coverage. The receivers on the outside are running seven- to eight-yard curl routes. The quarterback reads the defense and finds the open receiver. These curl routes are very simple. The routes are extremely difficult to cover when the corners are put on an island. The corners have to cover the deep ball and anything short as well, so the corner gives up the short pass, which the Utes will gladly take. The receivers go eight yards downfield, turn and the quarterback finds the receiver most open. This play is very difficult to stop since the safeties and linebackers have the tight ends to worry about. 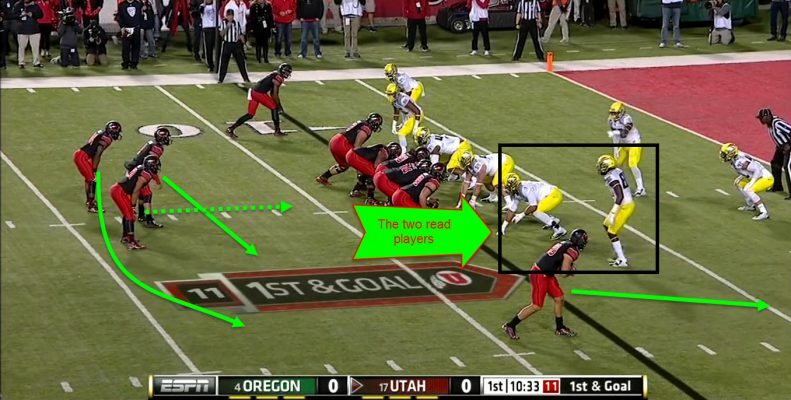 If the tight ends are left open, it becomes a big gain for Utah. The strength of the Utes, though, has been the tough defense who will always hit you in the mouth. The Utes’ defense is very tough against the run. Last year, it took a few series for the Ducks to figure out the defense. 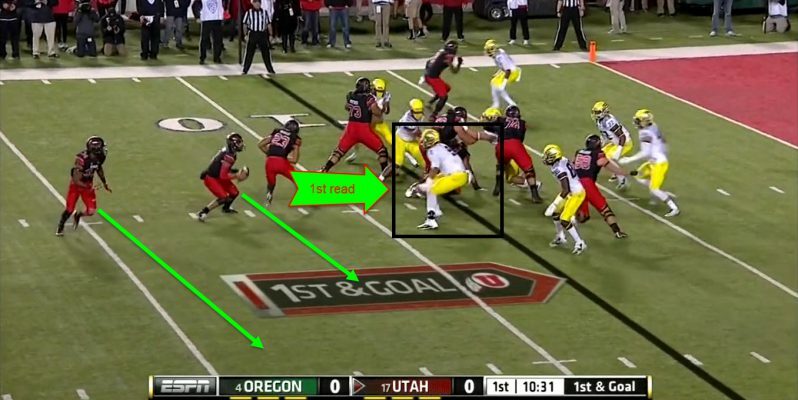 So let’s take a look at how Utah stifled the Ducks. 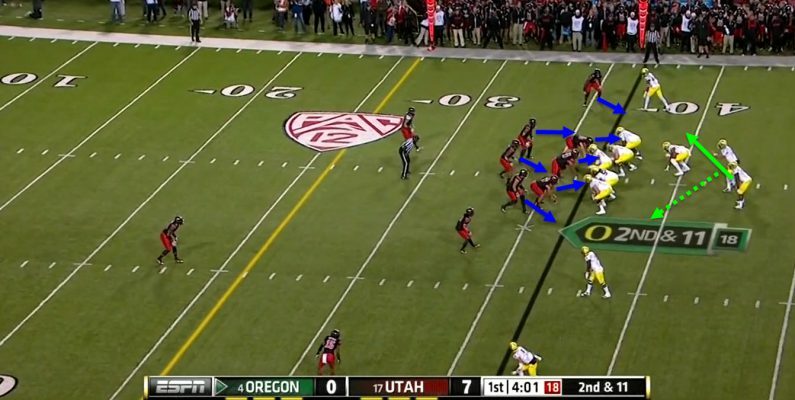 In the screenshot above, the Utes are lined up in a 3-3-5 defense. The defensive line is going to be the key to this play. Utah loves to take away the run and force you to throw. Once the ball is snapped, the defensive linemen are going to rush upfield and left as they will be the ones to stop the running back if he gets the ball. The right outside and middle linebackers are filling the open gaps on the right. The Utes are going to be hungry for the win. The linebackers are too imposing for the quarterback to pull it. So, the running back gets the ball. This is where the Utes get creative. 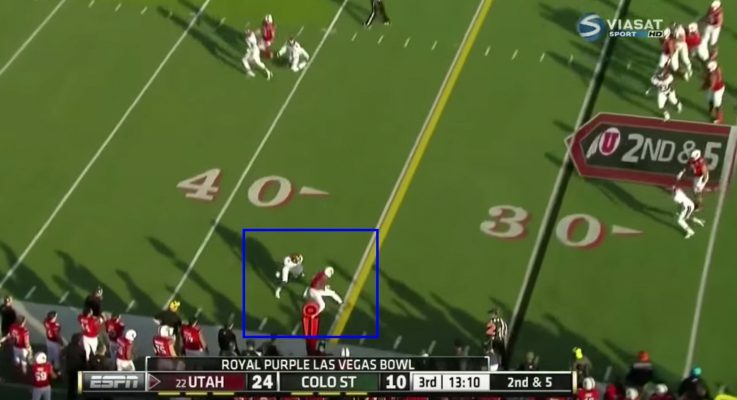 The Utes are playing zone, so the cornerback lined up on the left has his eyes in the backfield. When he sees that the running back has the ball, he breaks off his coverage and goes to help stop the run. Oregon has to find a way to have a balanced offense Saturday. 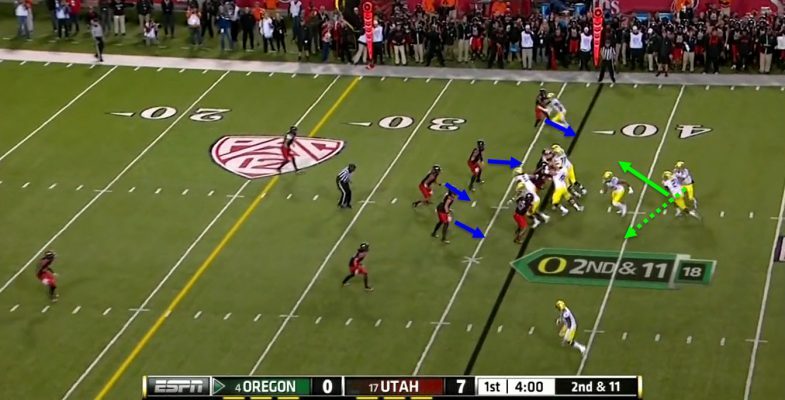 This is a great way to stop the zone read, the problem is that if the Ducks sell the zone read and run play action, the receiver is now in single coverage with the safety. The Utes are confident enough in their secondary, however, that they will allow this. The Ducks need to execute in order to take advantage of this. This is going to be a great game, the Utes are going to be hungry to get revenge for the brutal loss to the Ducks last year in Salt Lake City. To prevent this, the Ducks need to get out of the gate faster than they did last year as the game could have gone a much different way if that crazy 100-yard fumble return for a touchdown hadn’t happened. Some might think the game could be decided before it even starts. Others may say that whichever team has its starting quarterback on the field will win, but I say, “on the contrary.” The Ducks put up 61 last week with Jeff Lockie as the starter, and the Utes put up 45 with Thompson as their starter. These two teams are very comfortable with their backup quarterbacks so don’t expect much of a dropoff if either backup is called to start. I expect Oregon to be ready for this game and the fans to give Oregon some extra energy. Ducks win, 42-31, and start conference play with a Top 25 win.